Figure 1. Procedural time line. a. Pilot studies indicate that a haloperidol dosage of 3.0 mg/kg body weight per day delivers a steady-state plasma concentration in the target range (10-50 nM, human-like steady state concentration). Therefore, this regimine delivers a steady, chronic haloperidol exposure through day 60 post-implantation; lasting drug effects can be studied beyond day 60.
b. Each mouse is weighed and a 60-day release implant is formulated from engineered pellets ranging from 2 mg to 10 mg (in 0.5 mg incremements) to deliver the required dosage. Before receiving an implant, mice are anesthetized with isoflurane for at least 2 min to minimize handling stress and pain. c. Haloperidol pellets are implanted subcutaneously along the cervical region using a trocar (Note: For the first few days after exposure to haloperidol, food and water are positioned more accessibly near the bedding surface). Behavioral measurements are obtained with the least invasive test first and culminating with the collection of tail blood samples (see below). Testing is done at specified times post-implantation (Fig. 1). a. Mice are placed in the open field arena (Fig. 2) and monitored for spontaneous locomotor activity via built-in photocells for a duration of 1 h.
b. Recorded activity data are parsed according to total distance traveled (cm), vertical activity (number of beam breaks), stereotypy (repeated breaking of the same beam, number of beam breaks), and time spent in the central region of the arena. c. Mice are tested on days 0 (baseline), 30, 60, 90, 120 (relative to drug implant on day 1). e. The open field arena is thoroughly cleaned after each test. a. 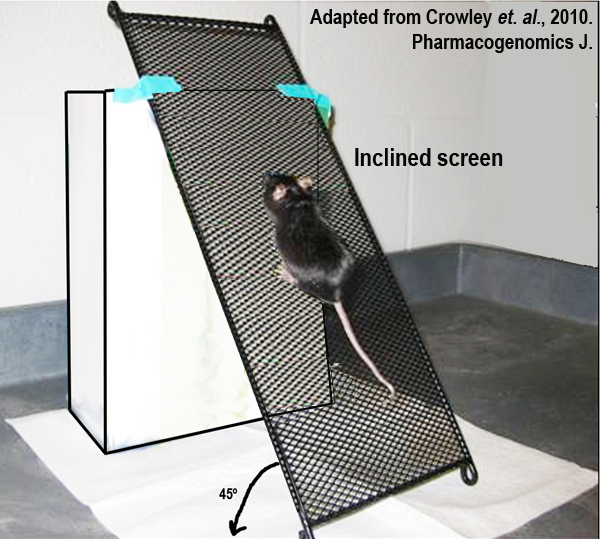 Mice are placed in the middle of the screen with their heads toward the top and their tails down (Fig. 3). c. The latency to move all four paws is recorded for maximum duration of 5 min. d. Mice are tested on days 0 (baseline), 1, 2, 3, 4, 5, 6, 7, 30, 60, 90, 120 (relative to drug implant on day 1). e. The inclined screen setup is thoroughly cleaned after each test. a. 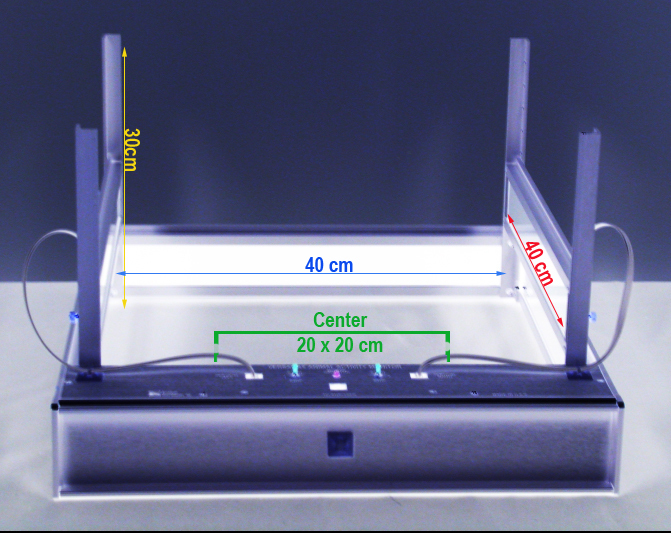 A custom made restrictor device is assembled atop a horizontal platform (modified from the method of Tomiyama et al.) equipped with high-resolution digital camcorder properly positioned for recording orofacial movements (Fig. 4). b. Each mouse is briefly anesthetized using isoflurane and placed in the restrictor device. 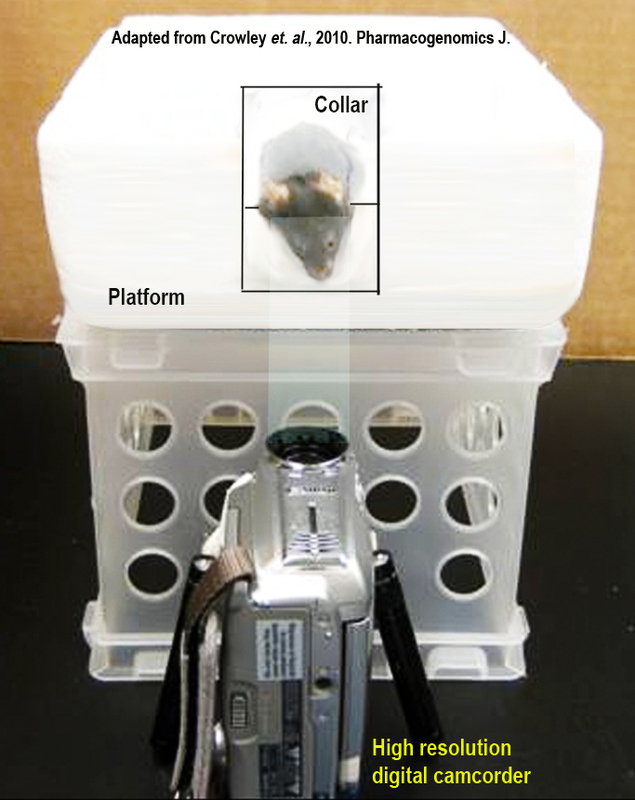 c. With the mouse partially immobilized around the neck, a high-resolution digital camcorder is focused onto the orofacial region from below the horizontal platform. d. Each mouse is kept in the restrictor device and video recorded for 25 min. e. The video recording platform setup is thoroughly cleaned after each use. f. Fully trained raters*, blinded to all study data including strain and study time point, are then randomly assigned to score the final 15 min of each video recording. g. The final 15 min are scored according to four distinct orofacial movements: tongue protrusions, overt chewing movements, subtle chewing movements, and jaw tremors. Tongue protrusions and chewing movements are measured as counts of individual events and tremors as total duration. h. Mice are tested on days 0 (baseline), 30, 60, 90, 120 (relative to drug implant on day 1). 3. Scoring of training tapes continues until the new rater reaches consensus criterion. To monitor drift, the same training tape is periodically and blindly scored. Submitting PI notes: "Inter-rater reliability among the three raters was high (intra-class correlation of 0.92), as determined by individual scoring of 32 randomly assigned and blinded video recordings." a. After conducting behavioral tests, a tail blood sample is collected from each mouse in the presence of anticoagulant. b. Blood samples are centrifuged for at least 5 min to separate the plasma. c. Plasma samples are kept frozen until assayed using mass spectrometry. d. Plasma haloperidol concentration is determined on samples taken on days 30, 60, 90, 120 (relative to drug implant on day 1). Figure 2. Open field apparatus. Figure 3. Inclined screen test. Figure 4. Restrictor device for recording orofacial behavior.